This year as Hanukkah approached, I craved matzo ball soup (usually associated with Passover.) My husband did not complain about having to eat matzo ball soup and proclaimed my soup to be one of his top ten favorite dishes. (Recipe is here.) But as we came to the final night of Hanukkah, I couldn’t resist making latkes. This year I tried a variation with Brussels Sprouts, based on a recipe from foodwanderings. I substituted our sweet potatoes from the garden instead of regular potatoes. Our sweet potatoes are only slightly sweet, almost a cross between a regular potato and a sweet potato and are very tasty. I didn’t have fresh mint or dill but used fresh parsley and fresh cilantro. I loved her suggestion of cumin seeds and used both the seeds and ground cumin. The cumin worked really nicely! 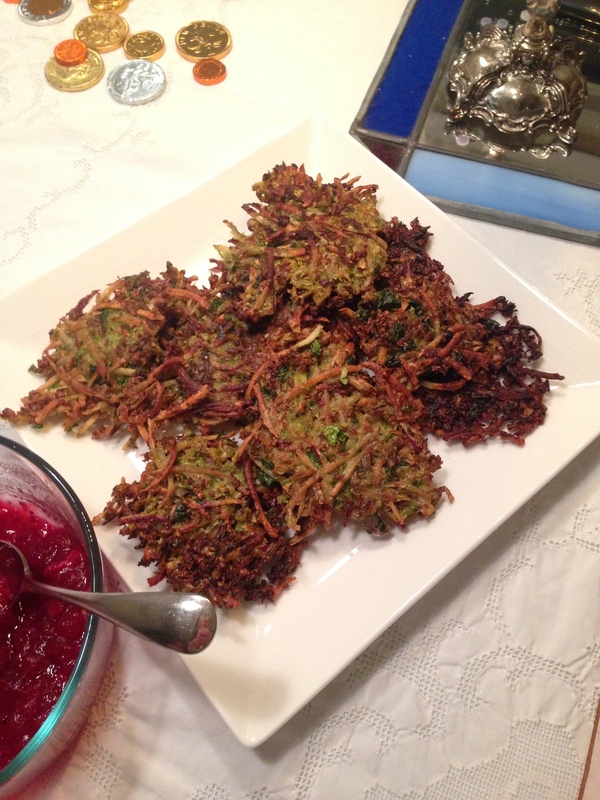 Click here for the original Brussels Sprouts and Potato Latkes recipe. I served it with leftover cranberry clementine compote (acknowledging Thanksgivikkuh) and a puree of parsnips and winter vegetables. I think it would also be lovely with the traditional applesauce and sour cream. Since there was a lot of batter after making enough small latkes for the three of us, I made one large “hash brown” with the remaining batter and baked it in the toaster oven at 400°F for 20 minutes. It was easy to reheat in a pan the next day. Little Bird LOVED Hanukkah. 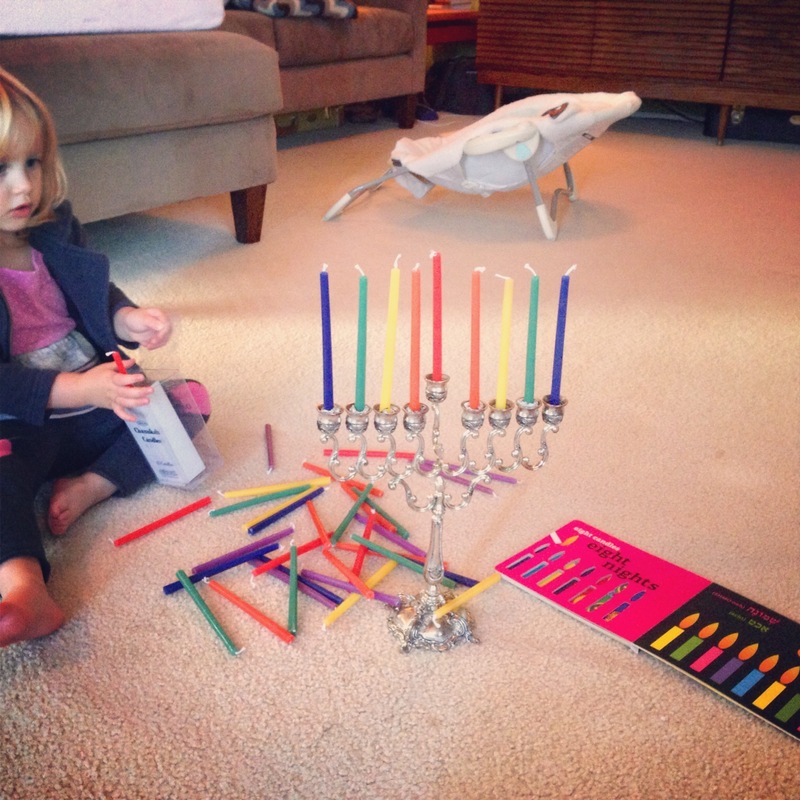 At 26 months, this is technically her third Hanukkah, but this is the first year she really got to experience it. With all the counting candles, it is the perfect holiday for a toddler! This entry was posted in Food, Recipes from the Garden, Seasonal Recipes and tagged farm to table, meals for the whole family, vegetarian. Bookmark the permalink. 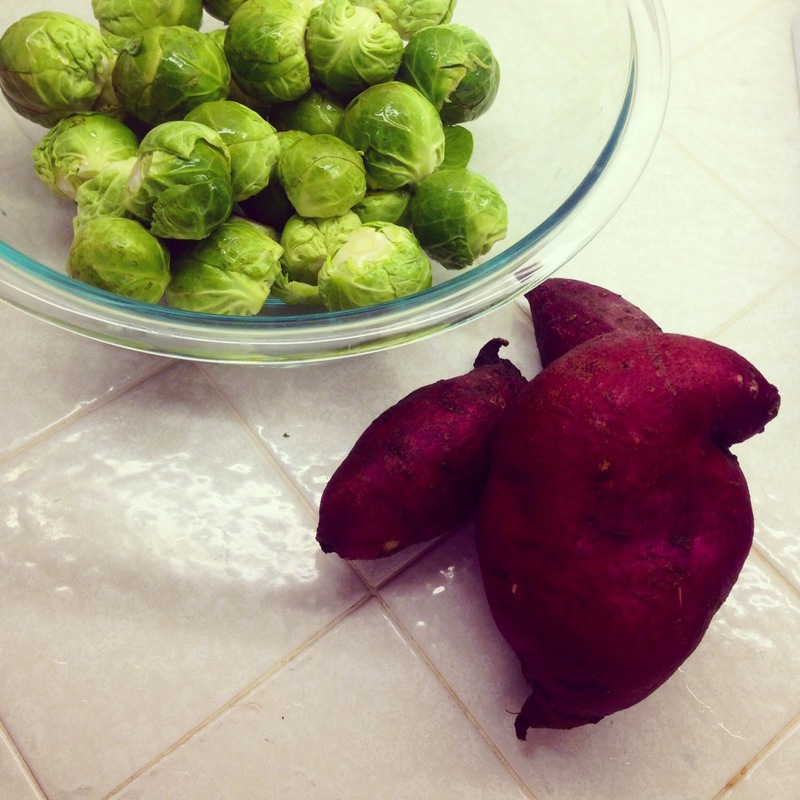 I’ve made sweet potato & zucchini latkes before but never thought of brussels sprouts. Sounds delicious. Danielle, me too! I usually do half zucchini (which makes for a very wet batter.) I liked this one better. Brussels get so sweet when fried. oh! those look delicious! I hope you have a wonderful holiday! Thank you Kate! It was so fun to see it all through my daughter’s eyes. Now on to Christmas! Looks yummy. Love a good latke.